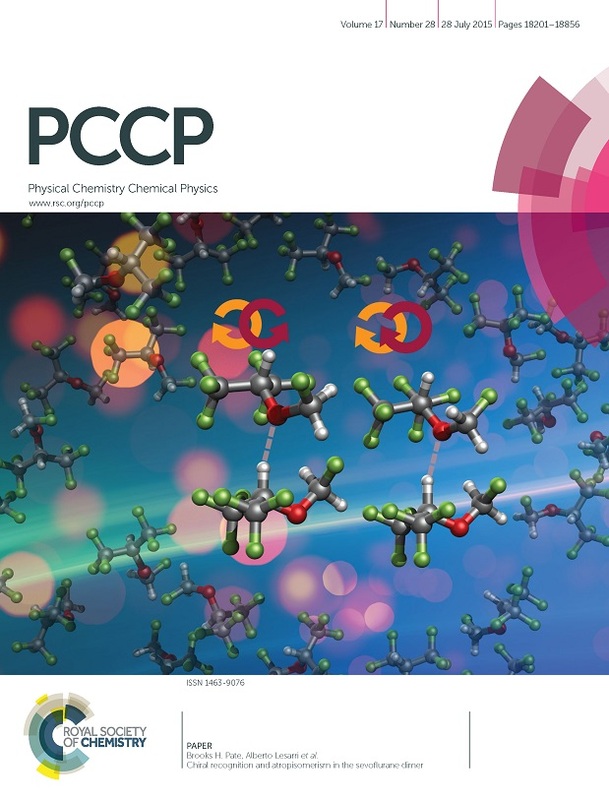 A collaborative study between Pate’s group (Virginia University), Lesarri’s group (University of Valladolid) and our group concluded in PCCP publication which was highlight as Journal cover by the journal. Phys. Chem. Chem. Phys., 2015,17, 18282-18287. In this work we have examined the stereoselectivity of molecular recognition between two molecules of the anesthetic sevoflurane using broadband rotational spectroscopy. The transient axial chirality of sevoflurane is revealed upon the formation of the dimer, as two different diastereoisomers made of either homo- or heterochiral species are detected in a supersonic jet expansion. In both clusters the complex is stabilized by a primary C–H···O hydrogen bond, assisted by weak C–H···F interactions. This intermolecular binding regime is characterized by a mixture of electrostatic and dispersive interactions, midway between classical hydrogen bonds and van der Waals clusters. Montse got Juan de la Cierva contract. Congratulaitons!!! 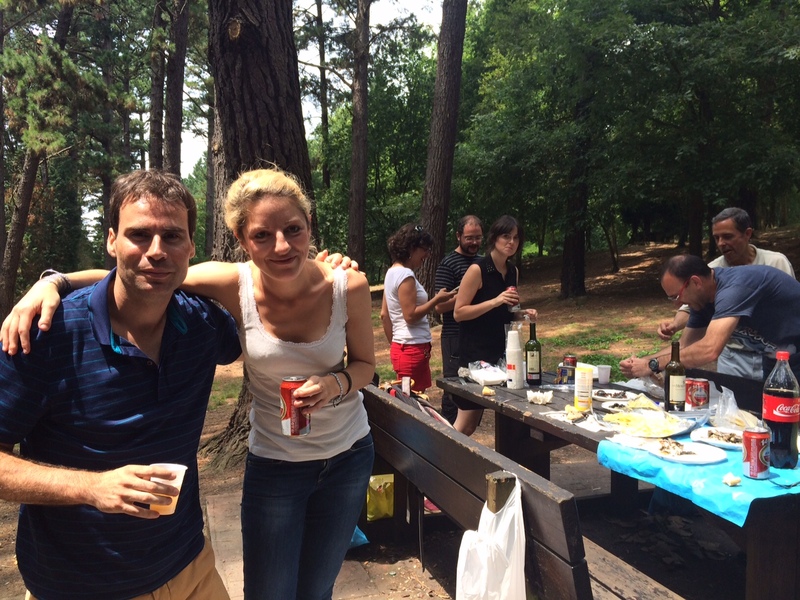 Montse Vallejo got a Juan de la Cierva fellowship (2-years contract) and she is moving to our group in September. 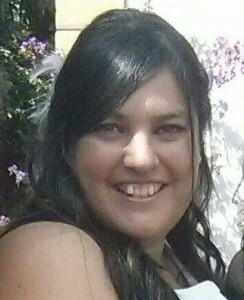 Congratulations Montse!!!! 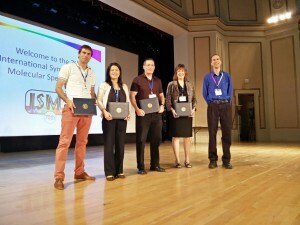 The International Symposium on Molecular Spectroscopy (ISMS-2015, June 20 – 24) was organized by second time in Champaign-Urbana (Illinois). The meeting brought together about 500 researchers. Emilio gave a Flygare Award Lecture (which recognizes outstanding contributions on the molecular spectroscopy) at a Plenary Session on “What can we expect of high-resolution spectroscopies on carbohydrates?“ and Iciar titled her talk “Unravelling the Conformational Landscape of Nicotinoids: the Structure of Cotinine by Broadband Rotational Spectroscopy“. 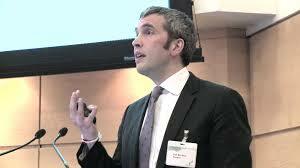 Emilio J. Cocinero was also elected new member of International Advisory Committee for the three next years. Photo: (From left to right) Emilio J. Cocinero, Shanshan Yu, Richard Dawes and Susana L. Widicus Weaver received the Flygare Award. Rolando Lozada and Pierre Çarçabal came to our laboratory to do some measurements. The visit was a success and we could characterize a new system. 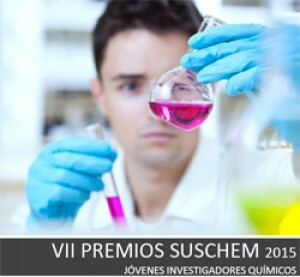 Prof. José Luis Mascareñas Cid, Prof. Nuria López Alonso, Prof. Ruben Martin Romo, Prof. Kilian Muñiz Klein, Prof. Concepció Rovira Angulo, Prof. Felix J. Zamora Abanades, Prof. Luisa De Cola, Prof. Eva M. Hey-Hawkins, Prof. Ferenc Joó, Prof. Joao Rocha, Dr. Moses Gulías Costa, Dr. Julio Fillol Lloret, Dr. Carlos Martí Gastaldo, Dra. Rocio Ponce Ortiz and Ms. Maria Luisa Prolongo Sarria. The scientist at the University of Oxford Prof. Ben Davis, an expert in the study of the effects of carbohydrates and proteins in disease development, gave a presentation entitled “The World is made of sugar and dirt”. Professor Davis has focused his career on the border between chemistry, biology and biomedicine and its work has led to the advancement of scientific knowledge, drug development, markers and probes. In addition, Prof. Davis had the opportunity to visit our laboratory. We discussed about current and future projects. 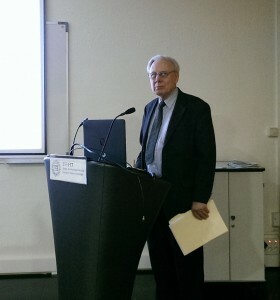 Picture: Prof. Benjamin G. Davis giving a talk. 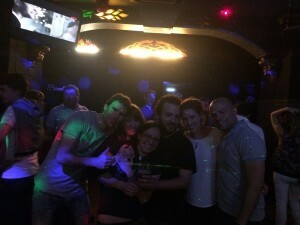 Sonia Melandri and Camila Calabrese in Bilbao… again!!! Sonia Melandri and Camila Calabrase (University of Bologne, Italy) visited our laboratory during one and two weeks respectively. They conducted experimental measurements in our laboratory successfully. Camila, Emilio and the rest of the Group in a barbacue. Iciar Uriarte, Marta Fernández, Virginia Ovejas, Jorge González, Jone Garate, Pedro Arnaiz and Monste Vallejo presented six oral communications and a posterat the VII Meeting of Young Researchers in Atomic & Molecular in Physics. 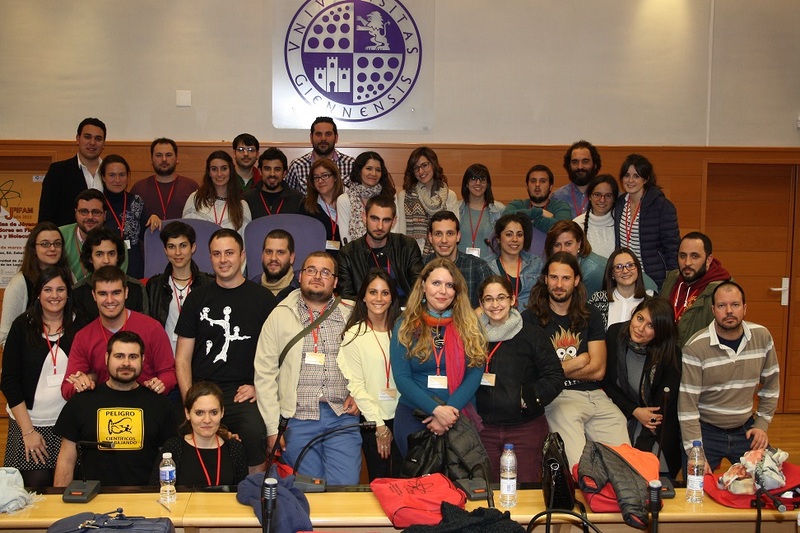 The event was organized by the University of Jaen (March 18-20) and is a great opportunity for young Ph.D. and postdocs to meet and share research experiences (without their bosses…). The meeting was dedicated by Dr.Alberto Garcia-Vela, president of the GEFAM, the group of Atomic and Molecular Physics of the Spanish Societies of Chemistry (RSEQ)and Physics (RSEF). The participants in Jaen are shown in the picture below. 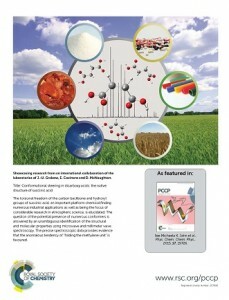 The torsional freedom of the carbon backbone and hydroxyl groups of succinic acid, an important platform chemical finding numerous industrial applications as well as being the focus of considerable research in atmospheric science, is elucidated. 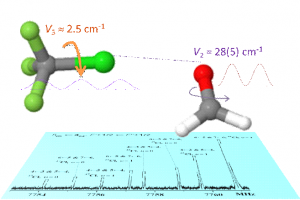 The question of the potential presence of numerous conformers is answered by an unambiguous identification of the structural and molecular properties using microwave and millimeter wave spectroscopy. The precise spectroscopic data provides evidence that the anomalous tendency of “folding the methylene unit” is favoured. 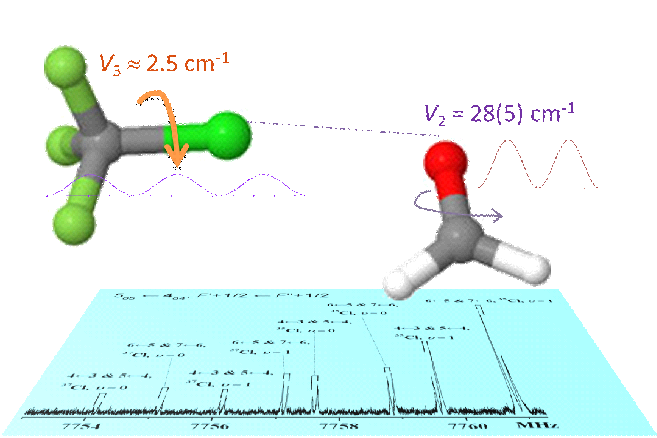 Internal dynamics in halogen bonded adducts was studied by microwave spectroscopy of chlorotrifluoromethane – formaldehyde complex. The interesting chemical aspect of this complex is that the two constituting molecules are held together by a halogen bond. The interesting spectroscopic aspects are the features of two large amplitude motions occurring in the complex: the almost free internal rotation of the CF3 top and the low barrier to internal of CH2O. All this work was published Chemistry A – European Journal. 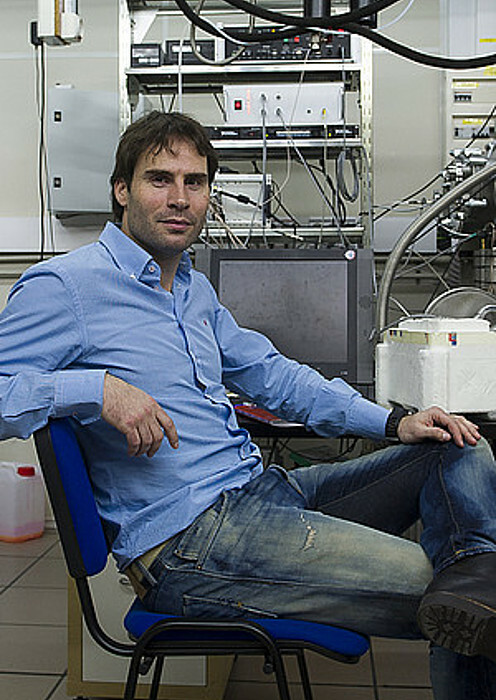 Emilio J. Cocinero, Physical Chemistry Researcher of the University of the Basque Country (UPV-EHU) was awarded with the Flygare Award Lecture to the best young researcher, for his achievements in the field of Molecular Spectroscopy. The Flygare award, which recognizes the contributions of young scientists in this field, will be presented to Cocinero in the next edition of the International Symposium on Molecular Spectroscopy, to be held in June in Illinois (USA). 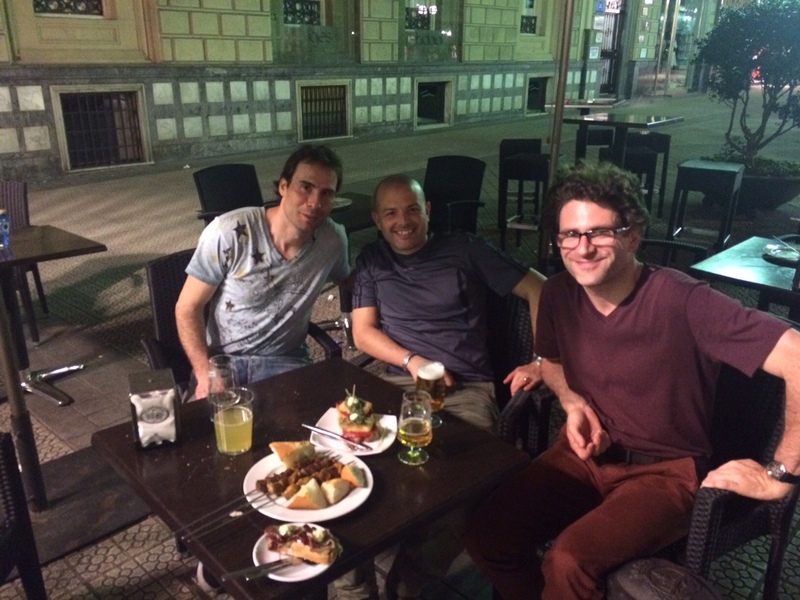 Valladolid chemist, within the framework of the Conference, will give a lecture on “Elucidating Structures of Carbohydrates by High Resolution Spectroscopies”. Photo: Emilio J. Cocinero in front of Microwave spectrometer.